This is a mini series about Christmas markets in Umbria. This small region of Italy has four main spots where the magic of Christmas comes alive along the city streets. Here I will describe the markets in Perugia, the capital of Umbria. The forthcoming towns are Massa Martana, Spoleto and Foligno. In northern European countries and in Italian regions that were influenced by the Nordic culture, the custom of the Christmas Markets is very heartfelt and popular. On days when there are these markets, all the artisans put their handicrafts on display: wooden statuettes, figures of the nativity scene, candles, ribbons and decorations of all kinds to decorate the home (such as wonderful balls to hang on your Christmas tree). There are also stalls selling typical culinary delicacies of the place. 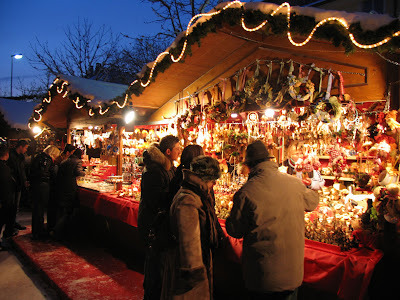 These Christmas markets usually begin during late November and last until Christmas Eve. The Christmas markets of Perugia are an excellent occasion to buy original presents to bring back home. It's been a few years now that even in Perugia Christmas Markets started animating the entire Christmas holiday period. For tourists it will be an opportunity to dive into the colorful world of handmade creations, looking for gift ideas or just browse the various stalls immersed in the characteristic atmosphere of the festivities that Perugia can create. During the month of December until Christmas, the Strenne Market will take place in Piazza del Circo in Perugia. Stalls offer Christmas decorations, toys, gifts, decorations. In addition you can buy local handicrafts such as leather bags and the "cocci" traditional ceramics produced on site. The market is open from 9 am to 9,30 pm from December 1 until the 24. This Christmas market is divided into two areas, one dedicated to crafts and the other dedicated to gastronomy. In the stalls you can buy lots of products to make original gifts such as Christmas decorations, home decor, candy, toys and crafts.